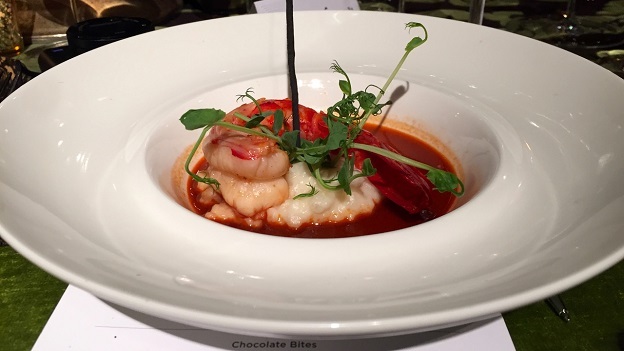 I was thrilled to be a part of the 11th Grand Cru Culinary Wine Festival, held this past fall in Toronto. The weekend long program of seminars, tastings and dinners hosted by an incredible collection of luminaries from the worlds of wine and food in conjunction with Toronto's community of passionate winelovers raised a total of C$5.5 million for the McEwen Centre for Regenerative Medicine, one of the world’s leading centers focused on stem cell research. 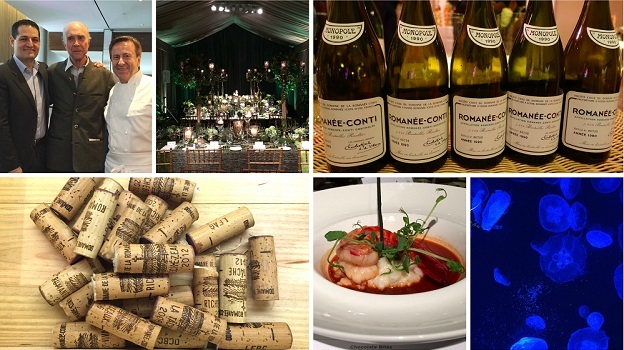 These two smaller events within Grand Cru showcased the wines of Domaine de la Romanée-Conti and raised C$1 million. 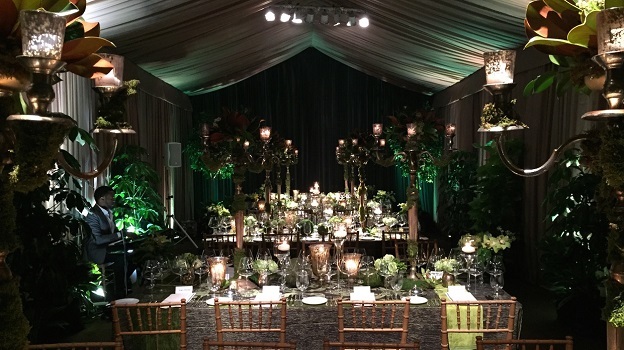 Friday’s dinner was held in the private home of Grand Cru Co-Chair Todd Halpern and his wife Ellen, and featured the cuisine of Jason Fox of Opus, one of Toronto’s hottest destinations, paired with a selection of wines from Domaine de la Romanee-Conti. Co-Manager Aubert de Villaine made the trip over from Burgundy for the occasion. Dr. Tirone David, one of Toronto’s most renowned cardiac surgeons, was the guest of honor, while I had the privilege of walking the assembled guests through the wines. The 2007 Montrachet is a great way to kick off dinner. Airy, weightless and totally classy the 2007 is a cool, super-sophisticated Montrachet that is also absolutely delicious with the Spanish shrimp. The 2007 is decidedly restrained in style, yet all the elements are in the right place. I am surprised by how good the 2009 Richebourg is at this stage. Swaths of tannin frame an explosive core of fruit in a Burgundy endowed with a real sense of gravitas. The radiance and ripeness of the year has filled out the wine nicely, yet the 2009 remains a quintessentially powerful, substantial wine that will last decades. Although the 2009 is many years away from peaking, it is a real joy to catch it at this early stage. One of the most purely enjoyable wines of the evening, the 2000 Romanée St.-Vivant graces the palate with an exotic melange of Asian spices, blood orange and dried flowers of all kinds. The 2000 is a striking RSV that speaks to finesse and grace. On this night, it is simply stunning. The 2001 Échézeaux is wonderfully lifted and delicate, with distinct elements of dried rose petal and sweet spices that are woven throughout. I don’t see the 2001 making very old bones, but it is quite expressive today. 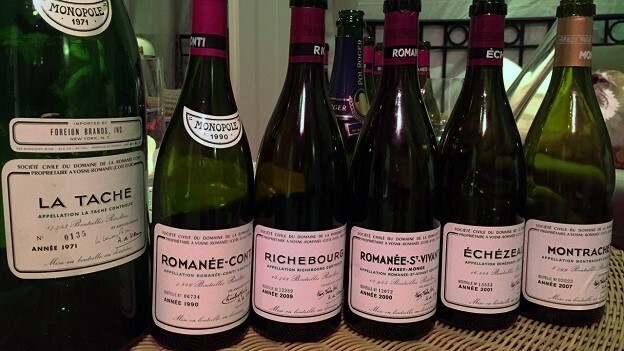 Another wine with extraordinary aromatic presence, the 1990 Romanée-Conti is just beginning to enter the peak of its maturity and also quite feminine in its personality. As it often is, the Romanée-Conti is elusive and, at times, fleeting. The 1990 constantly changes in the glass, inviting a second taste, and then a third. It’s hard to see the 1990 improving much from here, but it is gorgeous today. Dinner comes to a rousing finish with the 1971 La Tâche, served from jéroboam. Nineteen seventy-one is Aubert de Villaine’s wedding year. As it turns out, the domaine bottled a significant number of large formats to celebrate, which is one of the reasons a few jéroboams remain. On this night, the 1971 La Tâche is simply mesmerizing. Haunting in its bouquet and silky on the palate, the 1971 is entrancing from the moment I first taste it. 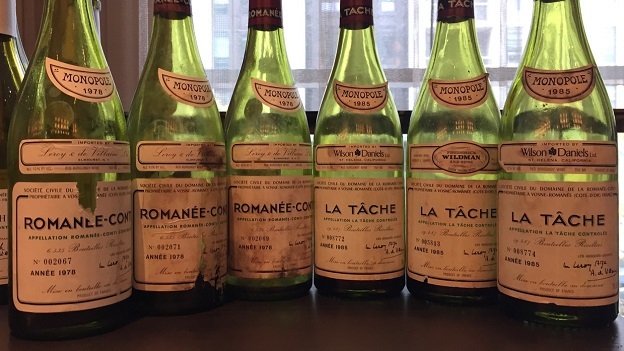 A wine from a tiny crop, the 1971 La Tâche is incredibly deep and expressive, yet also miraculously weightless. Orange peel, cinnamon, lavender and dried rose petals are some of the many nuances that unfold into the hauntingly beautiful finish. Saturday morning starts with a comparative tasting of the 2012 and 2006 vintages across four wines; Échézeaux, Romanée St.-Vivant, Richebourg and La Tâche. I confess I have a deep personal interest in this tasting, as 2006 is my son’s birth year. I can still remember tasting these wines from barrel with Aubert de Villaine and Bernard Noblet, the estate’s long-time cellarmaster. Our first pairing is, in some, ways, the most interesting, because the quality of the respective vintages is so evident, while the personality of the vineyard is much more subdued than is the case later in the tasting. The 2006 Échézeaux is weightless, precise and finely cut, but it is also a touch fragile and missing some depth through the middle. 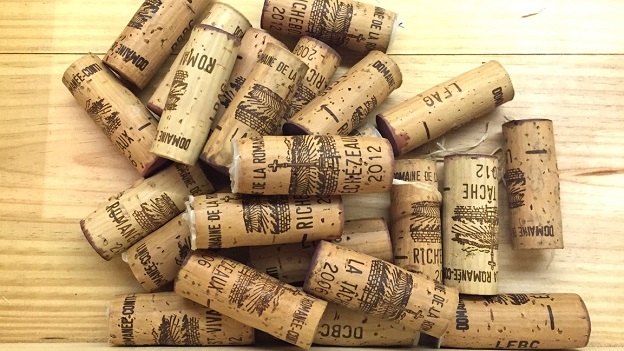 A rich, explosive wine, the 2012 Échézeaux is a real overachiever. Here the flavors are expansive, dense and layered, with all of the intensity of the year very much in evidence. Discussing the relative merits of vineyards is one of the central aspects of appreciating Burgundy. This tasting shows why Échézeaux is not as highly regarded as some other grand crus. Specifically, the quality of the wines is more vintage dependent here than it is elsewhere. The 2006 Romanée St.- Vivant is surprisingly powerful, yet also quite spherical in shape. I very much like the precision and nuance. The 2006 has considerable energy and it should drink well for a number of years. It is also a big step up from the Échézeaux. An intense, almost exotic wine, the 2012 Romanée St.-Vivant takes the elements that make RSV such a distinctive site and simply amplifies all of them. Dense and yet also seamless on the palate, the 2012 RSV will need considerable time to shed its baby fat, but it is impressive just the same. Both of these Richebourgs are endowed with superb site-specific character. Then again, we are talking about Richebourg, one of the most distinctive and assertive vineyards in Burgundy. The 2006 Richebourg is dark and brooding, with tannins that still need time to resolve. 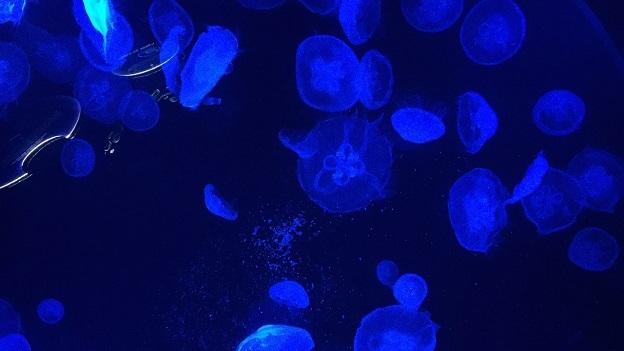 A sense of classic austerity runs through the 2006 that I expect will always be present. Vivid and towering in the glass, the 2012 Richebourg hits the palate with serious depth and overall intensity. Pomegranate, dark cherry, chalk, mint and wild flowers are front and center. Bright, primary and unbelievably intense, the 2012 is fascinating to taste today for educational purposes, but it will be many years before the wine is ready to give pleasure. Our final pairing is remarkable. 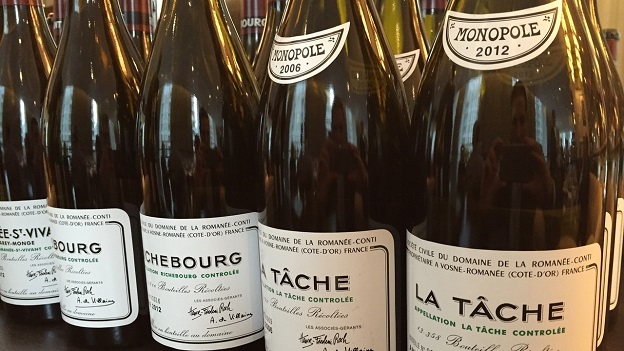 The 2006 La Tâche is the most layered and pliant of these four 2006s. I especially admire the wine’s inner sweetness and perfume, both qualities that carry through to the creamy, expressive finish. This is a terrific showing from the 2006. A wine of almost raw, animal power, the 2012 La Tâche possesses stunning depth and intensity. Savory, floral and red citrus notes are pushed forward in an unusually virile, imposing La Tâche. Readers will have to be patient here, which will not surprise anyone familiar with the vintage. Still, I am taken aback by the wine’s embryonic intensity. 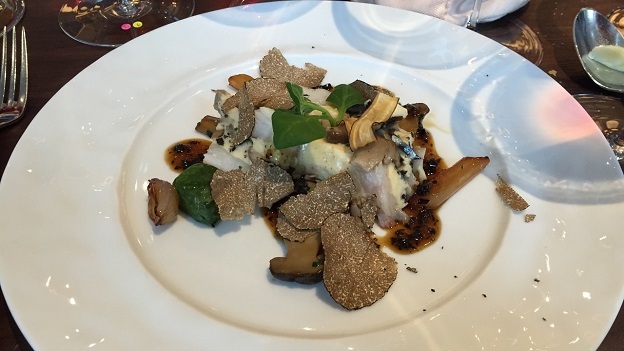 Chef Daniel Boulud prepared a delicious lunch to pair with a selection of older wines. One of the things I enjoy most about doing events with Boulud is his meticulous attention to detail. A relentless pursuit of excellence accompanies the adrenaline rush of tasting through all the wines and making sure everything is perfect for the lunch. The farm-raised egg stuffed with truffle, a last minute addition to the menu, is the inspired result of a late night conversation the night before between Boulud and Chef Gilles Goujon, who runs the three-Michelin star L'Auberge du Vieux Puits in Fontjoncouse. 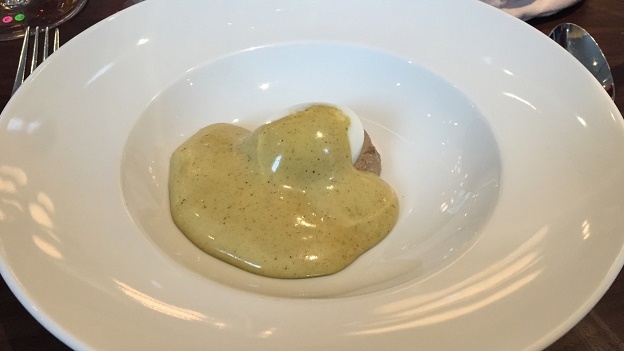 The egg was intended to be the first course, but the preparation is so complex that the dish was only ready towards the end of the meal, which added a welcome element of spontaneity to the afternoon. Lunch starts with the wild turbot stuffed with porcini, salsify and Périgueux sauce, a signature dish from Jean-Francois Bruel, the Executive Chef of Restaurant Daniel in New York City. The richness and intensity of the flavors marries nicely with the 1985 La Tâche, now fully mature and quite pretty. Exotic spice, dried herbs, rose petal and mint are all laced into the subtle finish. 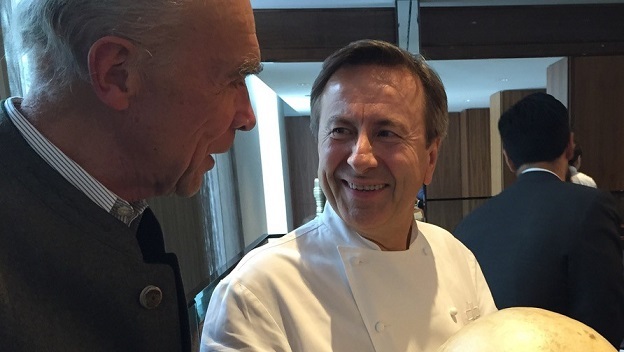 The chicken cooked in pig bladder stops all conversation as Daniel Boulud shows off his creation. Every bit as delicious as it looks, the chicken is a super-classic Boulud dish. 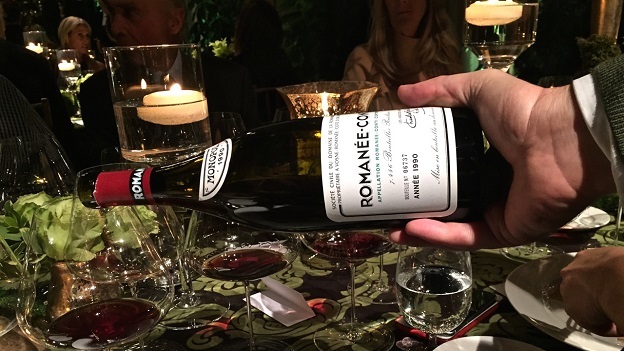 The 1978 Romanée-Conti offers lovely depth and inner sweetness, but it is also mostly resolved and offers little upside from this point forward. After several hours of anticipation, the egg arrives. It is worth the wait, especially as Boulud showers truffles over the egg. 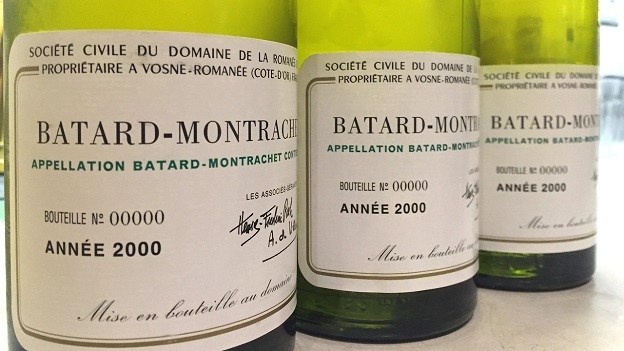 The Bâtard-Montrachet is the domaine’s rarest wine, as it is never served outside the estate. Soft, open-knit and silky, the 2000 is quite subtle and delicate, with plenty of orchard fruit, mint, orange zest and floral notes. For my taste, the Bâtard is a bit too delicate for this dish. Tasted from magnum, the 1995 Montrachet is off the charts. Apricot jam, orange blossom, honey and spices are front and center. The Montrachet has everything the Bâtard doesn’t have, specifically weight, richness and intensity. Extravagant and opulent to the core, the 1995 is simply magnificent today. What a wine. A last minute addition, the 2009 Montrachet is an inspired wine to round out the afternoon. Radiant, youthful and racy, the 2009 has a sense of youthful optimism that seems especially appropriate to the occasion. 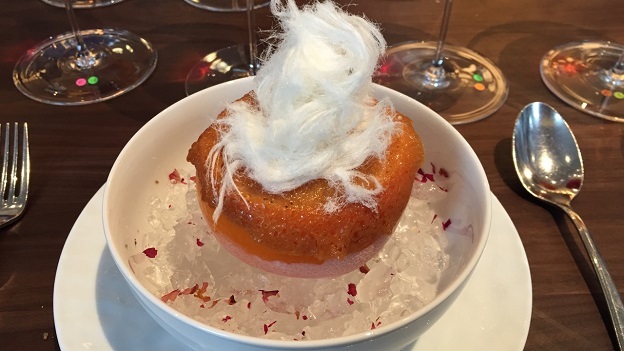 I am not a huge dessert fan, but the Grapefruit Givré, a hollowed out grapefruit filled with grapefruit sorbet and candy, is both delicious and refreshing. The assembled guests begin to disperse as lunch wraps up. The memories, well, they will last forever.